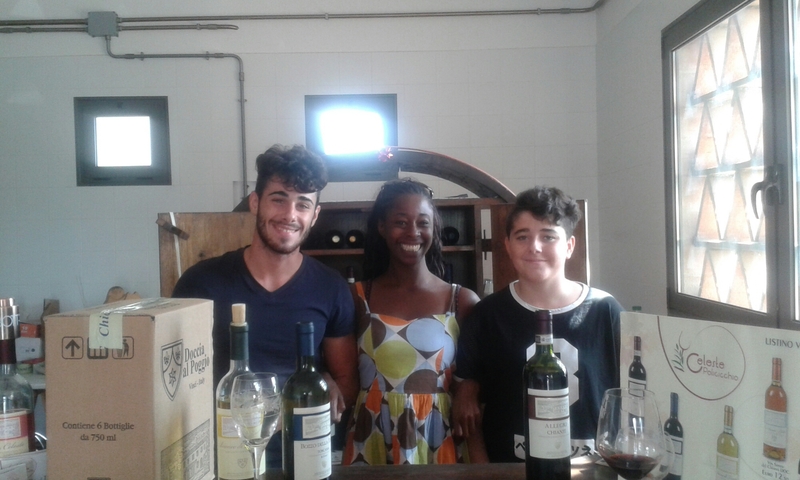 There are so many wine tasting tours around Tuscany, I wanted to go where the locals go so while in the small town of Vinci (where Leonardo Da Vinci was born) we popped into the local wine and olive farm, Doccia al Poggio, which is directed by Celeste Policicchio. Celeste wasn’t around but his young sons were at hand to pour us some generous measures of everything they had to offer. They had little English and I had about five words of Italian but we got on well. They even happily posed for some pictures! Steeped in history, the farm was the property of Count Mesetti, who was a nobleman and pioneer of racing cars. Today the Policicchio family produce six wines. A white Bianci di Toscana, a Chianti, a Tuscany red, a rose and a dessert wine. I tried four (it was Sep 22 and they had already sold out of two wines and all of their olive oil). The white had delicious scents of honey and a fruity warm taste. A great one for slurping with a cheese and fruit feast or casually. The Chianti had good character and the other red was less impressive but good by all means. The dessert wine was actually one of the finest I have tasted. We took some white, Chianti and red bottles. The prices range from 2.50 euros (for the cheapest wine that was sold out) to the most expensive (dessert wine) at 12.50 euros. We spent 16 euros on four bottles. Posted in Food, shopping, Travel, VinciTagged budget, cheap wine in italy, Doccia al Poggio, Tuscany, vinci, wine tastingBookmark the permalink.